There are many myths that are widely thought of as true, but actually are not. And yet other, actual facts are treated as myths. A good example is the myth that the correlations of GRE® scores with grades are so low as to suggest that the GRE® General Test is of no value. This myth may come from the perception among some academics that the correlations between GRE scores and graduate GPA should be as high as the correlations they see in their own fields of study, such as medical research, aeronautics or chemical engineering. In reality, in the field of educational measurement, the correlations between GRE scores and grades are quite meaningful. In fact, the correlations are stronger than many claims that are commonly believed to be ironclad truths. For example, would it surprise you to learn that GRE General Test scores correlate more highly with students’ graduate GPA than smoking is likely to predict lung cancer? How about scores from the GRE Analytical Writing section are better predictors of a biological and biomedical science doctoral programs student’s grades than taking hypertension medication is of a reduced risk of stroke? 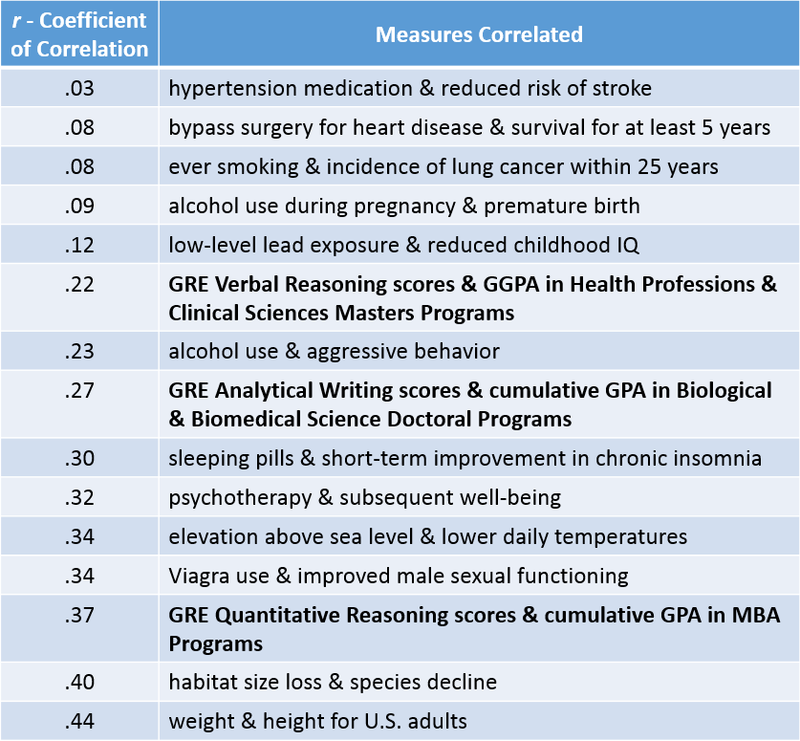 The truth is that the GRE General Test is more highly correlated with graduate-level academic readiness and performance than many commonly accepted correlations curated from popular psychology, medicine and everyday life. 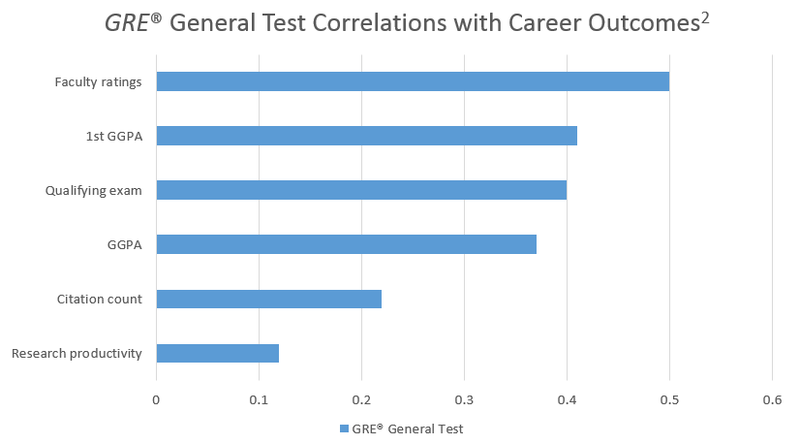 Yet despite dozens of studies validating the GRE tests by external, independent researchers, ETS continues to encounter criticisms based on unrealistic expectations that correlations between GRE scores and GPA — a relationship that is greatly affected by grade inflation — should compare favorably with correlations observed in other fields. Our own misperceptions can be the most difficult beliefs to change. GRE scores serve a critical function as the only common, objective measures that allow faculty committees to compare applicants from different educational, social and cultural backgrounds. The test is proven to be highly valid in measuring what it says it was designed to measure: graduate school readiness. It’s also proven to be a reliable predictor of what it claims it can predict — first-year GPA — as well as outcomes beyond that, such as cumulative GPA and faculty ratings of student performance. And this is true for both master’s and doctoral program students, according to a meta-analysis of more than 100 research studies by University of Minnesota researchers. The correlation between scores and grades can tell us more than just who is likely to succeed academically. They can also tell us which students are likely to struggle. As shown in the graphs below, which are based on real data from six biological and biomedical sciences master’s programs, a test correlation that explains less than 4 percent of the variance in first-year grades can be very useful for identifying students likely to struggle. For the graph on the right, the authors identified students within each department who were in the top or bottom GRE Quantitative Reasoning (GRE-Q) quartiles, noted the percent of students in serious academic peril (GPA less than B-) in each quartile, and averaged these across the departments. Although based on exactly the same data, the graph on the right tells a far different story than the graph on the left. Thus, GRE scores can be useful to faculty not only in making admissions decisions but also in identifying students who might benefit from additional support to help them stick with and be successful in the program. The GRE General Test has been proven in dozens of reports over several decades to be a valid predictor of first-year and cumulative GPA, among other outcomes, in both master’s and doctoral programs. All three sections of the test are valuable in predicting cumulative GPA across many programs of study, including programs in STEM, the humanities, business and law — and with stronger a correlation than the correlations between many important variables in psychology, medicine and everyday life. The correlation between GRE scores and grades not only helps to identify students likely to succeed, but those who are likely to struggle and may benefit from extra support to ensure their success. Please email gretests@ets.org for more information about the validity of the GRE General Test. 1 GRE correlation information in this chart can be found on pages 20 and 24 in New Perspectives on the Validity of the GRE® General Test for Predicting Graduate School Grades and on page 5 of The Validity of Scores from the GRE® revised General Test for Forecasting Performance in Business Schools: Phase One. Other correlations referenced in this chart can be found on pages 130–132 in Psychological Testing and Psychological Assessment: A Review of Evidence and Issues. 2 GRE correlation information in this chart can be found on page 1080 in Standardized tests predict graduate students’ success, an article in Science magazine. The correlations are for Verbal Reasoning and Quantitative Reasoning scores combined, but do not include Analytical Writing scores. 3 Law school correlation information can be found in The Validity of GRE® General Test Scores for Predicting Academic Performance at U.S. Law Schools.